Home Career Planning Course Choice Doctor But Looking For Other Options Than Hospital? Being from India, it isn’t quite uncommon to see parents immediately dubbing their child a “future doctor” moments after they are born. While many kids later drift on to other dreams and ambitions like astronomy or sports, a significant number remain fixated on this idea of being able to help people and save lives. However, we don’t realize just how much work it takes to actually become a doctor and continue pursuing it as a profession, until we are locked in our rooms, strenuously preparing for NEET. 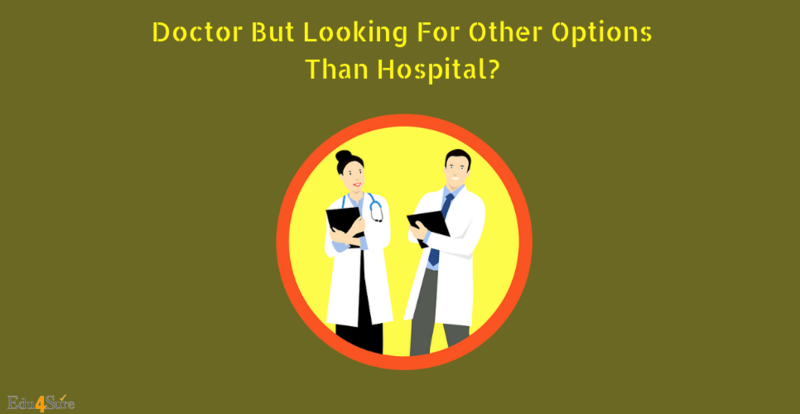 Sometimes though, even after getting that MBBS seat and getting the prefix “Dr.”, people may find that the gratification they expected is not there, or that the lifestyle is simply not cut out for them. For the people who grew up as diehard fans of Sherlock Holmes and Nancy Drew, this is an ideal choice. Doctors who pick their field of specialization as forensics analyze bodies and specimens collected from crime scenes. Needless to say, these are closely tied in with investigations and you would be required to deal with your fair share of law. Forensic pathology is an incredibly important line of work and sometimes makes the difference between a case being solved or not. If you have a sufficient knowledge in law as well as medicine, you could take up a profession as a Medico-Legal Advisor (or MLA) for short. An MLA comes in when a doctor or a clinic’s professional reputation comes under fire. This includes things such as negligence claims, other investigations or fatal accident inquiries. The MLA must advise the client on how to proceed with their case and help them prepare their defense. It is important to have a critical eye and an analytical mind for this job and who knows, you could be saving the profession of many a doctor! If the classroom is where you like to be, teaching is the profession for you. Even the medical field needs educators to help pass on knowledge and bring for the next generation of doctors. Teaching, in itself, is a noble profession and will also keep you on your toes as you have to keep updating yourself and your knowledge about the current affairs of all that is happening in the medical world. Studied medicine but have a true passion for words? Then medical journalism is the way to go. Medical journalists record and bring forward advancements in the medical field. Considering, your pre-existing knowledge in the medical fields, you will be able to understand and write with a sufficient depth. Your writing will be found in professional publications, medical journals, and websites. All you require is a degree in journalism and you’re good to go. Nope, HR or human resource is not just for IT companies. Recruitment is a very important job in any field and it is so in the medical field too. As someone with a medical degree, you will know better than most, the requirements for a candidate to be a good physician. With this job, you will be hired by hospital chains and other companies who require the services of doctors. A physician recruiter just has to interview people and check how compatible they are for the job. If sports interests you, so will sports medicine. Pretty much every sport needs physicians and medical staff, not just to deal with sport related injuries but also for keeping tabs on players’ health throughout the season. This is a fun career option and could take you to many places and live locations. So there is the added advantage of getting to travel a lot too. While working at the front lines in dealing with patient care is important, what is of even more importance is working towards finding cures and remedies for the disease which can be used in patient care. Medical researchers do exactly that. The job involves conducting clinical trials and researching chemical compounds and the effects they have on the human body. Research is an incredibly vital part of the whole treatment procedure and medical researchers are the reason we have effective medicines to treat disease especially because the field is dynamic and constantly developing. Medical photographers use their creativity and photography skills too, you guessed it, take pictures of the human anatomy. These photos and videos not only help in patient care but are also used in textbooks and health publications. Even in the medical field, there are many diverging paths and each is just as unique and interesting as the next so rest assured, it’s easy to assess your options and find the ideal path for you. Previous articleShould An MBA Marry An MBA?